Kit tagliando moto/scooter C'e 1 prodotto. 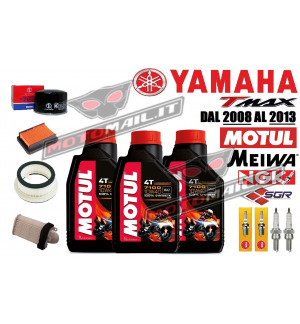 KIT TAGLIANDO PER YAMAHA T-MAX 500 ANNO DAL 2008 AL 2013. IL KIT COMPRENDE: - 3 LITRI DI OLIO MOTUL 7100 10W40. - 1 FILTRO OLIO MEIWA. - 3 FILTRI ARIA ASPIRAZIONE SGR (CENTRALE + 2 LATERALI CARTER) - 2 CANDELE CR7E NGK. - 1 ADESIVO REGISTRO TAGLIANDO.